At 3 p.m. on August 16, 2012, Duquan “Day” Davis reported to work at a Bacardi bottling plant in Jacksonville, Florida. It was his first day on the job, on assignment for Remedy Intelligent Staffing, a temporary employment agency. For Davis, 21, a recent graduate of the federal Job Corps program, the temp job at Bacardi was his first job ever. Less than two hours after showing up for his first shift, Davis was dead. The young worker had been sent to clean out broken bottles that were clogging a palletizer. While he was out of sight, the machine was started up again, crushing him to death. In Feb. 2013, OSHA cited Bacardi for 12 safety violations and proposed $192,000 in fines against the company, finding that the firm had not trained temporary employees – or its full-time employees – on the lock out and tag out procedure that could have prevented the start-up of the machine that killed Davis. "A worker's first day at work shouldn't be his last day on earth," said Dr. David Michaels, Assistant Secretary of Labor for Occupational Safety and Health. The fine against Bacardi was later reduced to $110,000. Remedy Intelligent Staffing – Davis’ actual employer – was never cited. The temp firm is part of the Select Family of Staffing Companies, America’s fourth-largest industrial temp agency, with $1.9 billion in revenue in 2012. Health and safety activists across the country are remembering Day Davis today, using the Twitter hashtag #DemandTempSafety. 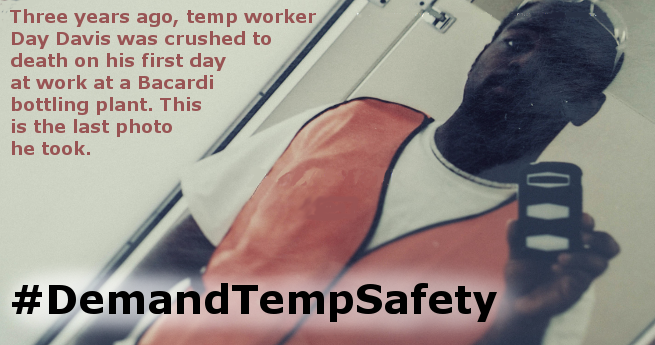 We’re calling for action to protect the millions of temp workers across the United States who are sent into potentially hazardous situations with little or no training, and with insufficient information about their right to a safe and healthy workplace. Davis’ story – and the heartbreak felt by the family and fiancée he left behind – is hauntingly told in the independent documentary “A Day’s Work.” The film was produced by David DeSario, himself a former temp worker. It features Barbara Rahke, executive director of PhilaPOSH and board chair of National COSH, and was screened at the National Conference on Worker Safety and Health in June of this year. “A Day’s Work” is gaining attention at film festivals and from labor and safety audiences in cities across the country. You can see the documentary at upcoming screenings in Massachusetts, Colorado, Florida, New Jersey, and Washington DC. This year, some 14 million Americans will work on assignment to a temporary agency. Three years after Davis’ tragic death, only a few states have laws on the books that offer protections for temporary workers, among them Massachusetts and California. In 2012, after successful lobbying by MassCOSH and other groups, Massachusetts passed the Temp Workers Right to Know Law. It requires agencies to key details of job assignments, in writing, to temp workers. In 2014, following a push by WorkSafe, SoCalCOSH and other advocacy groups, the California legislature passed a law will requiring host employers and their staffing firms to take joint responsibility for the health, safety, and rights of temporary employees. Too often, temp agencies and host employers still try to pass off responsibility for proper safety procedures. The host company says: “They’re not our employees.” The temp agency says, “It’s not our workplace.” As a result, workers fall through the cracks. A review of data in five states by the investigative news website ProPublica found that temps are 36 to 72 percent more likely to get injured at work than full-time employees. Improved protocols when OSHA investigates incidents involving temporary employees. Check out upcoming screenings of “A Day’s Work” in Massachusetts, Colorado, Florida, New Jersey, and Washington DC. For more information on temp workers, see the National COSH Campaigns page.